I found Anita to be reliable and incredibly engaged in my cat Syd’s health and well-being. She took great care to keep her on a consistent feeding schedule, gave her lots of cuddles and played with her often, even bringing her some new toys! I received photos and videos via text during my trip, which was incredibly reassuring. When I returned my little cat was happy and healthy. Thanks Anita. If you have found yourself on this page, are a cat guardian and live near Bayswater then it’s more than likely that you will be seeking cat sitting Westbourne Park for your cat during your travels. 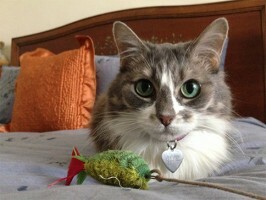 Syd was happy with Catnips who supplied cat sitting Westbourne Park and your cat will be too!